How ghoulish were stocks in October? Well, the S&P 500 lost almost 7% — the bellwether’s worst month in more than seven years – yet it still managed to outperform other stock indexes. NASDAQ dropped 9%, the small-cap Russell 2000 fell almost 11%, and the overseas EAFE index slid 8%. For the year, the S&P 500 is still up 3% and the NASDAQ is ahead 6%, but the Russell 2000 is down almost 1% and the EAFE index has lost a frightening 10%. A diversified stock portfolio lost more than 8% in October and is now flat for the year. Bonds lost 1%-2% last month, as interest rates moved up about 0.2%. Through October, a diversified bond portfolio is down 4%-6%, with long duration bonds and corporates doing worst. Overall, our traditional 60/40 lost more than 5% in October and is now down 2% for the year, while the conservative 20/80 portfolio lost almost 3% last month and is now down 5% through the first ten months of 2018. Corporate bond yields rose 0.2% during October, pushing pension liabilities down 1%-2%. For the year, liabilities remain down 5%-8%, with long duration plans seeing the biggest drops. Congress passed a budget in 2015 that includes a third round of pension funding relief since 2012. The persistence of historically low interest rates, however, means that pension sponsors that have only made required contributions will see contributions ramp up in the next few years as the impact of relief fades (barring a continued surge in long-term rates). Discount rates rose about 0.2% last month. We expect most pension sponsors will use effective discount rates in the 4.3%-4.7% range to measure pension liabilities right now. 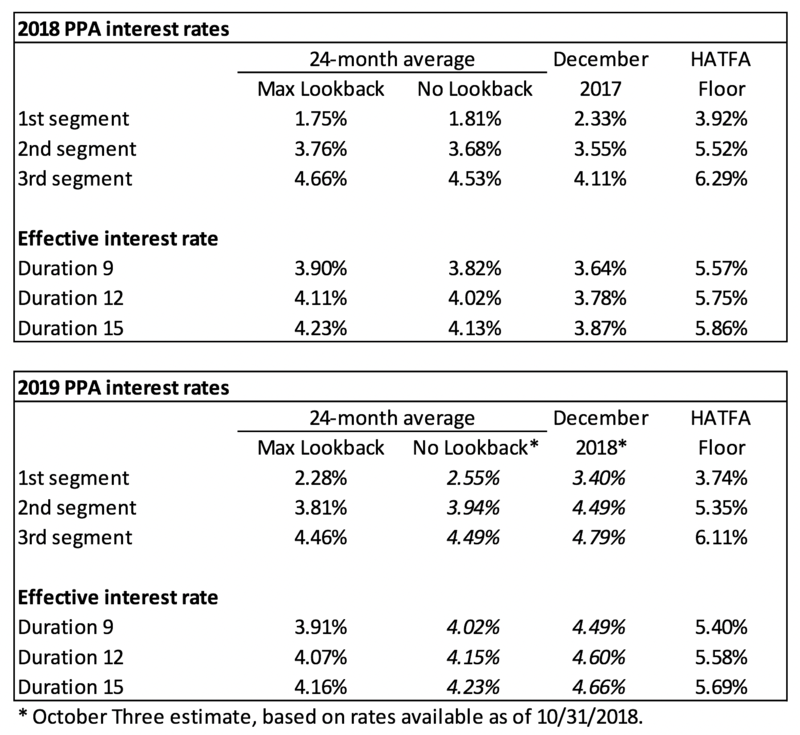 The table below summarizes rates that plan sponsors are required to use for IRS funding purposes for 2018, along with estimates for 2019. Pre-relief, both 24-month averages and December ‘spot’ rates, which are still required for some calculations, such as PBGC premiums, are also included. Plan A is a traditional plan (duration 12 at 5.5%) with a 60/40 asset allocation, while Plan B is a largely retired plan (duration 9 at 5.5%) with a 20/80 allocation with a greater emphasis on corporate and long-duration bonds. We assume overhead expenses of 1% of plan assets per year, and we assume the plans are 100% funded at the beginning of the year and ignore benefit accruals, contributions, and benefit payments in order to isolate the financial performance of plan assets versus liabilities.